December 17, 2015 - SOLD OUT! Skye is a little 45 pound firecracker! She has her junior hunt title and has gotten some field work this year also. She will continue training for senior/master level work. She is very good in the house. Skye will be 2 years old in May. No health clearances were completed, but she is EIC clear by parentage. Skye's Sire is Tall Pines Yukon SH and Dam is Tall Pines Nina. 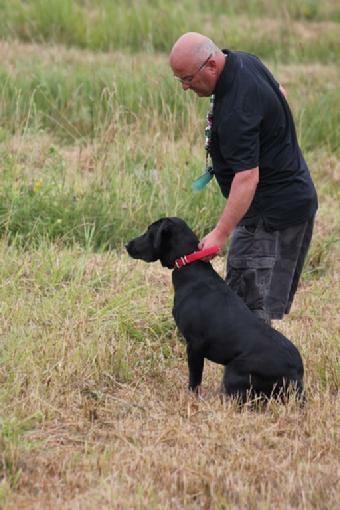 Skye is owned by Mike Vigus in Clayspoole, PA.
Tucker is a dynamic field retriever! Tucker also has his junior hunt title and sees field work for geese. Tucker was 2 years old in October. No health clearances were completed, however he is EIC and CNM clear by parentage. Tucker's Sire is Deep Run Dakota East MH and Dam is D & S Ziva the Total Diva SH. Tucker is owned by Rocky Mirakovits in Bath, PA.
Dew claws were removed on 12-21-15. Pups will be wormed at 3, 5 & 7 weeks of age and will receive their 6-week vaccinations and will be vet checked and certified healthy by Dr. Sam Yoder of Silver Maple Veterinary Clinic. Born and raised in our home....well socialized. Ready to go home February 12, 2016. Puppies will be AKC registered and the D&S guarantee will be given on them.